Herbs have their own tastes which are characterized as sour, acrid, bitter, salty, sweet, bland, and temperatures which are characterized as hot, cold, warm and neutral. The properties of taste and temperature of each herb has specific effects. The therapeutic actions of substances can be described by linking its taste and temperature qualities. 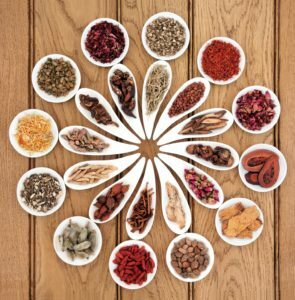 Oriental herbal medicine has unique techniques for combining herbs in order to get desired and effective results known as mutual accentuation and mutual counteraction. Mutual accentuation is the combination of two substances with similar functions to accentuate their therapeutic actions. Mutual counteraction is a combination in which one substance’s toxicity or side effects are reduced or eliminated by another substance, and so forth. Herbs are one of two major pillars to support Oriental Medicine. Acupuncture and herbal formula are often prescribed together to treat a specific disorder and symptoms. How are the Herbs Prescribed? Each herbal prescription is unique & developed to suit each patient’s individual health needs at a particular time. The herbologist selects herbs to compliment or enhance their positive effects while simultaneously balancing or reducing potential negative side effects. No two formulas are alike. Unlike western medicine, the balance and interaction between all of the ingredients are more important than the effect of any individual herb. Decoctions consist of raw herbs which are cooked and consumed as a tea. Raw herbs are the most potent (and therefore also the most expensive) form of herbal medicine. We do not recommend that patients cook raw herbs at home, as the process is complicated and time consuming. For your convenience, decoctions are prepared off-site and delivered directly to the patient in pre-cooked, individual servings. Raw herbs are crushed into a powder (or granules) or paste, which is then mixed in warm water and consumed as a tonic or tea. These are standardized formulas, which are usually sold in capsule or pill form. Patent medicines are more affordable but less potent than decoctions or paste medicines. 1. Is herbal medicine safe for vegetarians/vegans? Yes, we offer vegetarian/vegan safe herbal formulas. We only the finest quality ingredients, selected and purchased from reputable sources in the U.S. Most formulas contain over 90% plant & mineral materials (leaves, bark, roots, etc.). We never use materials from endangered species. 2. Can I take herbal medicine with my other medications? Yes, generally herbal medicine is safe to take along with most other medications and supplements. However, herbal medicine should not be taken within 2 hours of any other medications. You must consult with the acupuncturist about any medications and other supplements you are currently taking starting any herbal formula. 3. Can I do a detox with herbal medicine? 4. How are the Oriental herbs different from other types of “detox herbs” on the market? “Detox herbs,” colon cleansers, and other similar products usually contain a laxative or fiber supplement (or a combination of both). They work by encouraging the purging of waste material already present in the gastrointestinal tract. They contain “herbs” only in the sense that the dietary fiber usually derived from plant material. On the other hand, Chinese herbs work not only to cleanse your GI tract, they also help purge toxins and wastes deeply imbedded in the tissues and organs of the body such as the kidneys and liver. We also provide high quality, natural herbal pills built for specific conditions. Give us a call at (860) 502-9462 if you would like to come in for a FREE consultation on how our herbs can help you improve your health! Are you looking to receive acupuncture in West Hartford, Connecticut? We take pride in helping our community in West Hartford, Hartford, Avon, Simsbury, Windsor, Farmington, New Britain, Bloomfield, Cheshire, Middletown, Enfield and more across Connecticut.